Set in the darkest corners of London Oliver Twist is a scathing critique of class divisions and the inhuman treatment of England’s poorest individuals. Overall I enjoyed Oliver Twist. It was not what I expected. All I knew of it was the famous ‘please Sir can I have some more?’ line, and from that I assumed it was going to be a story set in an orphanage, which was true of the beginning but not of the majority of the tale. 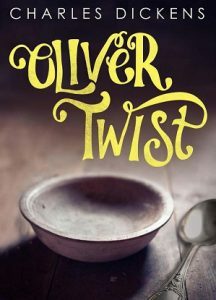 Instead the focus was on the people and conflicts around Oliver, an orphan with a mysterious past. There was robbery, arson, murder, betrayal and lies abound, and the story was far darker than I anticipated. When reading classic novels I am always interested in examining representations of women. Throughout Oliver Twist women were presented as agents of temperance and guidance, and as life givers and manipulators. They were repeatedly referred to as being smarter or more clever than men, and yet none had any real power within the story. I found this deeply frustrating, as a modern reader, to see that women had so little agency. Dickens’ habit of long reflective or recapping paragraphs at the beginning of chapters was also painful to read at times. However when you realise that it was written and published as a serial in a newspaper the style of chapter titles and introduction sections makes a lot more sense. It just doesn’t read like a typical novel in structure, and I did wonder if Dickens had even plotted out the entire thing when it was first published, as some characters seemed to shift their attitudes (perhaps in response to readers’ opinions) and the story really stagnates in the middle for quite a few chapters. They both express complex situations – a prostitute with no hope for her future, and a murderer in the throes of guilt – and have stuck with me as markers of the emotional layers of this book. Despite its flaws I enjoyed Oliver Twist. It’s an important novel in the evolution of social justice ‘campaigning’ via fiction, as well as a timely reminder that all human are just that, human, and worthy of both kindness and respect. And remember, if you are ever tempted to utter a phrase like this: “he went away; and he did die in the streets. There’s an obstinate pauper for you!” it’s probably time to read Dickens again.